"The best part of the surprising performance of this design is that A) it can be enjoyed stand-alone and B) it can be used with your typical sub. I fully expected this design to require a broadcast system to be usable. A system that would include 2 high quality microphones, a high quality microphone preamp, a second stereo amplifier and a second pair of woofers in their own respective cabinets placed somewhere in the room. I intend to continue to implement the broadcast system to see what happens, but it now clearly becomes optional for those who have the money and want to pursue it." A) it can be enjoyed stand-alone on certain music sounding better than real while sounding painfully thin on certain music. B) it can be used with your typical sub, yes. However, when implemented true to it's original design concept with the broadcast section both A and B would by comparison sound like a complete joke. Therefore while it could be used stand alone if you don't like a lot of bass, or with a sub, after hearing it with the intended broadcast system we will officially discourage both A and B !!! After taking 6 months off and deliberately not listening to these speakers I was feeling in a far more objective mood than when I left off. Allowing the proud papa syndrome to wear off as well as the desire to have this speaker fly stand-alone, I was ready to pick up where I left off and give these things a real objective listen once again as stand alone open baffles. I put one of my 6 watt triodes on them and let it warm up for a bit. My ears are now someone else's (a nifty side effect of taking 6 months off to see if you still like something) and I'm ready to hear everything wrong with it. I plop the disk in and press play. Now trying not to like them I had to admit the clarity was surprising. However this thin sounding recording was just screaming for some meat on it's bones. Within 3 or 4 minutes I had made a clear decision that this wasn't going to fly and turned it off. A few minutes later after some disgust wore off I turned it back on because I wanted to hear the sound inside the cavity again. I placed my ear near the opening and was instantly entranced by how rich and clean the bass lines were and found myself really enjoying the CD. I think my exact words to myself were something along the lines of "quick screwing around and finish the damn project so you can hear it work" Yes, let's stick to the original design and complete it. On to the broadcast system. This is where things get really interesting so if you've read this far, you'll probably want to continue. Again, to experience worse case (real world) performance rather than use $600.00 microphones on exotic tube mike preamps, I dug up some cheap Audix drum mikes and fed them into a $200 Berringer mixer feeding an old Ross solid state amp. If this concept actually works as well as I predicted - it should have livable results even with junk gear. If the test fails or sounds like crap with the junk gear than something is fundamentally wrong and the best good gear would do is make it almost right. While setting the up the electronics for the broadcast system I made several fascinating discoveries and actually had a couple of epiphany's that I'll never forget. The first epiphany came after listening to the non-compressed natural bass of the cavity against the same thing coming out of a pair of typical box speakers. This comparison would be all but impossible for most audiophiles to make because you would need a cavity design that closely copied the Zen Open Baffle and to date the design hasn't been released so nobody has one. I've spent 30 years listening to box speakers of all kinds as well as every other kind and well understand the colorations associated with boxes. My full range direct driven Acoustats make all but the very best box speakers sound silly and the most obvious difference shows up in the bass clarity. That coloration werew hear with boxes is gone. I've designed a few speakers and up until this design I thought that coloration was cabinet resonance and the standing waves inside the cabinet etc. What I realized is that the pressure created during lower frequency cone excursions not only compresses the air inside the cabinet but also seems to be compressing the distance between wavefronts and changing the pitch. These altered waveforms work against the cone causing smearing across the original phase angles of the driver. They also slow it down. The resonant cavity of the Zen Open Baffle has roughly 1/10th of the energy in it's panels as it would if there were a driver mounted in it like any box speaker. Therefore when you hear the sound inside the cavity, there is no distortion from panel resonance to be heard. There is also almost zero pressure inside the cavity so the sound inside is not aggravated or compressed by the pressure. Unlike a box speaker, even with the worlds best crossover, there will be sound inside the cabinet that falls well above the cabinets resonant frequency. 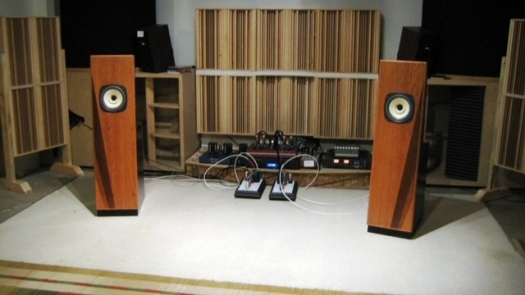 These mid's and low level highs inside box speakers leak out of the ports and through the speaker cone and by the time they leave the cabinet through either of these two mediums their phase angles no longer match the wavefront coming off the front of the cone. This is where open baffle speakers have such an advantage. There is no pressure, and there is no cabinet to poison the speaker cone. However, open baffles have no bass per say unless using multiple drivers or large drivers in large baffles. That means most open baffle speaker systems use a sub that can't sound as good as the open baffle because it's in a box. It also means that if your not doing that, you've lost your single point source by using more than 1 driver and along with it probably small size making the front of the baffle nothing more than a large sound mirror for reflecting sound from the room back to the listener - making it hard for the speakers to completely disappear. If you kill the point source conflict from multiple drivers by pasively crossing one over to reproduce only low frequencies, then you have poluted the puzzle with a crossover. The bass inside the resonant cavity of the Zen Open Baffle is seeded by the single 8 inch full range driver (DFR-8). That means the sound inside the cavity is virgin or pure in the sense that some other driver or electronics or both didn't create it. Because of this, it is seamless and perfect in it's coherency with the main driver - on an order of magnitude better than the best implemented subs (which I have). It is impossible for a typical box speaker to reproduce bass as realistically or accurately as the bass that is found inside the cavity. Again, the only thing that sounds like what's in the cavity are my Acoustats / but to own something as good today would start at $100,000 and require a large room and your willingness to live inside the sweet spot. Provided the sound inside the cavity is properly broadcast into the listening space it would be like hearing the single 8 inch full range driver's own bass in any proportion necessary to achieve the desired frequency balance. The trick to that is the transducer. The speakers used for the broadcast need to be anything but a conventional box speaker and capable of the incredible speed that is only possible in an enclosure by having nearly perfect dampening like a straight horn. Regrettably such a device would be too large too expensive and create room treatment issues just by it's size. The only other design up to the task is the HDT cabinet because of it's tremendous speed. The HDT cabinet is a cross coupled multi-chamber design with 5 tuning frequencies across over 2 octaves creating a death grip on the woofer cone. The wide band dampening makes it one of the most linear box designs I know of. If we used anything less, such as a simple reflex cabinet, be it sealed or ported, it's own colorations would mask the beauty of the cavity sound to the degree where you would loose 90% of the benefit. With the HDT's used as the broadcast speakers it is possible to accurately capture the magic of the cavity and seamlessly allow it to escape into the listening space. The broadcast signal is relative to the mic placement, type and so on. The mic will pick up background levels of high frequency information coming off the rear of the driver as tiny amounts are entering the cavity . This allows a natural shelf to develop between the low frequencies of the cavity and the cut off of the driver in it's baffle. By having this small trace of full range ambient sound up to about 5kHz and between 12db and 18dB down from the reference level of the Zen Open Baffles, the harmonics of the bass lines in the recording remain in tact from both positions on the arc. I'll talk about the arc soon. Anyway this is not possible with a sub approach and I find it to open up the music in a way so vivid that it has me questioning my Acoustats. I believe this must be a pretty natural form of desirable ambience in just the right trace amounts to lock in some really jaw dropping playback. A few people I know have been fortunate enough to build a pair of Imperial SO's and use them as the bottom end behind a pair of good box speakers. Not just for reference quality 20 cycle on up response but because of what it does to the imaging and scale of their main speakers. It takes the sound stage and explodes it in size and makes everything sound more logical and coherent. The imaging always appears far more organized and locked in space giving breath taking focus. You can see them behind the Zen Open Baffles in the picture below. Over the years I've tried more speakers in front of these 28 cubic foot horns than I can remember, and the majority of them gained this superior imaging and scale every time. The scale in particular I've always attributed to the size of the wavefronts from these big monsters, and the imaging I theorized was the result of the mid and high frequencies being somehow organized by the large fundamental wavefronts. I was apparently wrong on both counts. Finding the perfect placement for the broadcast speakers (HDT's) turned out to be on the outside edges of my listening arc. That put them about 1 foot away from the walls, but towed in true to the arc as are the open baffles. The picture below shows the 115 degree arc proportional in my listening space. Once I got this set up and listened to it I realized quickly that I was getting the same sense of scale and improved imaging as I did with the Imperials on other speakers. In fact the sound was so similar it was like having the imperials on. There was one difference that stood out, and that was the imaging and something absolutely magic about the bass. Far and away the cleanest, most open natural sounding bass, and fast, fast, fast. Deep and Rich with non-congested weight and scale that made the presentation far superior to the imperials in combination with these or any other speakers I've tried - something I never expected to top. Yes, it was the magic of the cavity and the implimentation of the arc that took the bass to this new reference level. So this blew my theory about the large wavefronts somehow organizing the mids and highs into a more coherent 3D image. The epiphany was realizing it's the width cues that we get in real life that are missing in almost all 2 speaker setups. Low frequencies that emanat from the same location as mid and high frequencies in real life, such as a band, always find the boundaries of the venue and wrap back in on the listener so the ear expects to hear these low frequencies come at it from the sides and arced back to the center. If the listening arc is too small, this is impossible. Using two subwoofers placed at the outsides of the arc will not accomplish the effect I am hearing. The speakers must be able to coherently play not only the low frequency information at the same level as the Zen Open Baffles but also reproduce the harmonics of those low frequency's for at least 8 octaves with high frequency content at background levels. Then there is the natural ambience of those frequencies that escaped from the main driver into the opening of the cavity to consider. This is the source of the high frequency content. The unbelivably real imaging.... perhaps it's the width cue that releases the brain from processing why information is missing from this area and lets it better process what is at the focal points. What's interesting is that the Zen Open Baffles do a fantastic job of imaging by themselves, but when the broadcast is added it simply transforms the imaging of the ZOB to jaw dropping heights and floats in the room independent of the speakers and regardless of where you sit or stand. It's just happening. In that respect it is performing like our Radial design. It should be understood also that you do not hear the broadcast speakers until you get your ear around 1 foot away from them, so they are never directly noticed. I've had several people listen to the setup without knowing anything about it and no one realized the broadcast speakers were on. Their level is of course adjustable based on the gain setting of the broadcast amp giving us a much needed tone control for listening to lean recordings. You can have as much or as little weight as you want, the imaging remains unchanged. Adding a little extra weight to a recording in this manner does not thicken up the bass or mud it up like it tends to on typical box speakers. Regardless of the level you are struck by how incredibly clean and open the bass is, and how richly it layers out without ever showing even the slightest hint of strain or compression or distortion. I've already been bombarded with the knee jerk statement, yea but its... four speakers! Like this is somehow a problem. My response is always the same... you already probably have 2 pairs of speakers in your possession now, yet you can only enjoy one pair at a time. Sell it all up and try this, it's the best way I know to make every dollar you've spent on audio gear count for something. Since it is possible to have good results with lower cost electronics for the broadcast, anyone owning a great sounding amplifier and willing to build their own ZOB array from plans will have an opportunity at the completion of this project. THE ZEN OPEN BAFFLE ARRAY. * BTW: The Neal Diamond CD turned from a less than pleasing recording that was avoided for years into an absolutely incredible sounding live experience. It felt and sounded totally real when played on the array and turned out to be a most impressive recording. Finally a system that can make everything sound right. Instead of listening to 10% of my music collection I can now enjoy 90% of it. When you can strike the right frequency balance, it is surprising how many bad recordings were actually quite good.